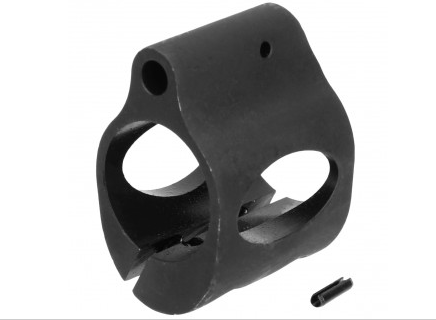 Our Low profile Clamp On micro gas block is CNC precision machined with superior quality steel. It is Heat treated, Erosion resistant with a Parkerized Finish. This Low Pro Micro gas block replaces the existing A2 front sight, and is sleek and small to allow a longer rail to be placed over. Can be used when installing a Mid Length, Specter Length or Rifle Length hand guard to a shorter length gas system barrel. It is compatible with 5.56/.223 with a .750 diameter barrel. Roll pin & set screws are included. No modification to your barrel is required.